Apple picking is one of my favorite fall activities. I usually peel the apples and cut then into eighths. Then I place the pieces on a baking tray and pop them in the freezer. Once the apples are slightly frozen I transfer them into Ziplock bag and they are ready to be used whenever I want to make apple pie or tarte tatin during winter. Sprinkle sugar in the cast iron. Fill it with the apple pieces, placing them close together. Place the pan over medium high heat on your stove top, and let cook for about 10 minutes and then place the pie in the oven for 15 minutes. Roll out the dough and place it over the pie. Using a fork, poke holes all over the crust. Cook in the oven for another 15-20 minutes, or until crust is golden brown. Let the pie rest for at 15 minutes before inverting. 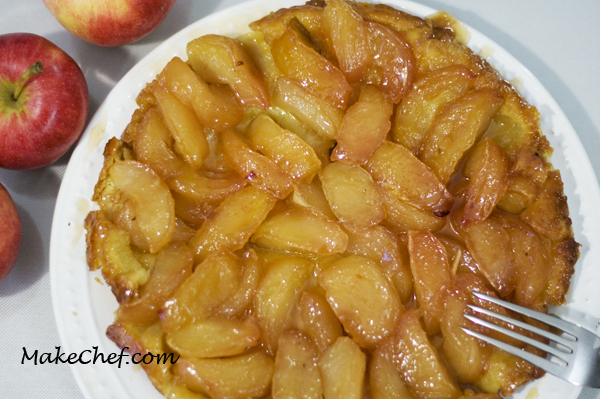 This entry was posted in Dessert, Flour, Recipe and tagged apple, pie, tarte-tatin.